Maria Marquis is excellent as Lady Macbeth in "Macbeth" at the Dragon Theatre. The show runs March 15 - April 7, 2019. 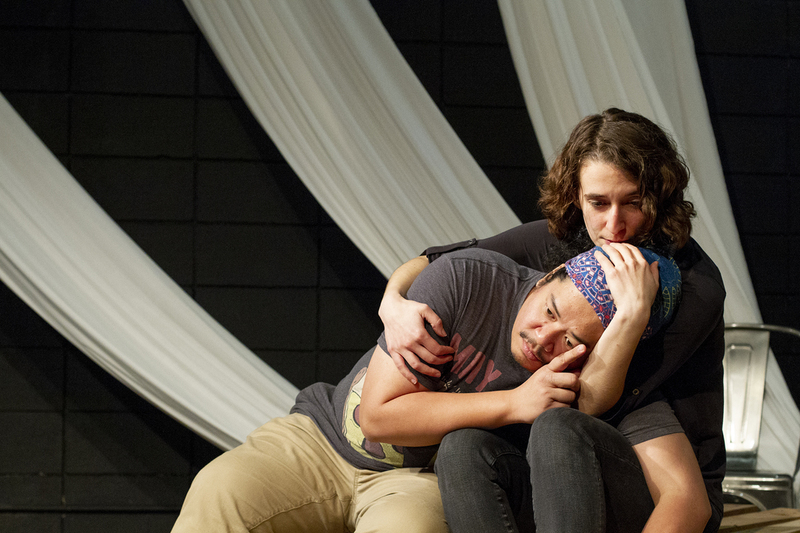 “Macbeth,” currently on stage as part of the Dragon Theatre’s 2nd Stage series, is a triumph, the work of a small production team in which everyone is devoted and does the work. It’s not just producers and directors Roneet Aliza Rahamim and Max Tachis — who also portray First Lord, Lady Macduff, one of the witches, First Soldier, Duncan, Macduff and Third Lord — the entire cast of eight helped with pre-production, and all help with shifting palettes and hanging drapes around as scenery and even take turns at the on-stage foley table. All are devoted to the show, and that makes for a very rich production indeed. 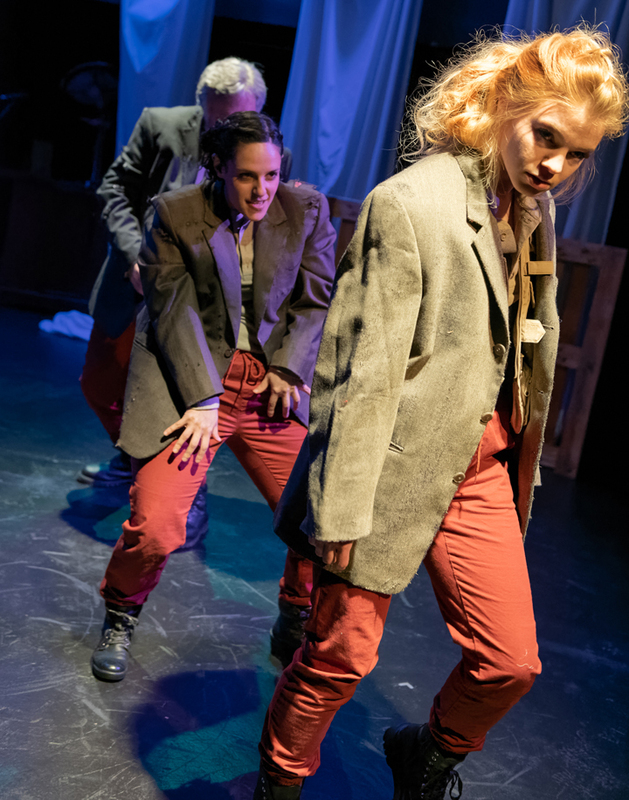 It was Tachis who delicately trimmed the play a bit, and combined some parts to make for a perhaps more smoothly delivered show than what the groundlings first experienced in 1606 or so. It runs for about two hours, with one, 15-minute intermission. The cast is excellent, starting with Tasi Alabastro as Macbeth, and Maria Marquis as Lady Macbeth. The three witches have told Macbeth he will be king, an idea he likes. But there are all these people who have to be murdered first, including the current king and others, including babies. Alabastro brings a thousand subtle and major movements to his brilliant performance, making clear Macbeth’s fears in the early part of the play, and his increasing anxiety and paranoia. Really, a master class in acting. And Marquis, as the original woman behind the man, is a beacon of murderous ambition. Marquis makes Lady Macbeth a truly lost and tragic character, and Alabastro’s tender Macbeth drives the point home. Alabastro — whom we have seen pretty much chewing the scenery with passion up until now — delivers that significant speech with a rather dull, neutral mien. It’s an old debate, actually. Is Macbeth troubled and hearthbroken by her death, in which case he is very emotional? Or does he not especially care, and just kind of shrugs his shoulders? Or is he so in shock that he can barely move? I prefer it to be a passion moment. Which it is not, in his production. Regardless, the show goes on, and it is excellent. The staging and costumes are minimalist, supported by Dylan Elhai’s excellent lighting design, and everybody’s work at the foley table. The little black stage has several shipping palettes that are moved around as needed, including three that are standing on end at the beginning, with the three witches who start all the trouble by telling Macbeth he will become king. We all know what happens with palettes standing on their ends, right? They make a lot of rude noise when pushed over, as they were, and anybody not expecting that probably needed to change their diapers at intermission. The costumes are simple: Everybody wears red pants and heavy black boots, with tops of neutral colors, adding the occasional jacket or vest as needed for different roles. That works very well, because it puts the emphasis on the acting and the movement. Which are very good. Blood, including that of slain babies, is connoted by bits of red cloth. The three witches were fun to watch. 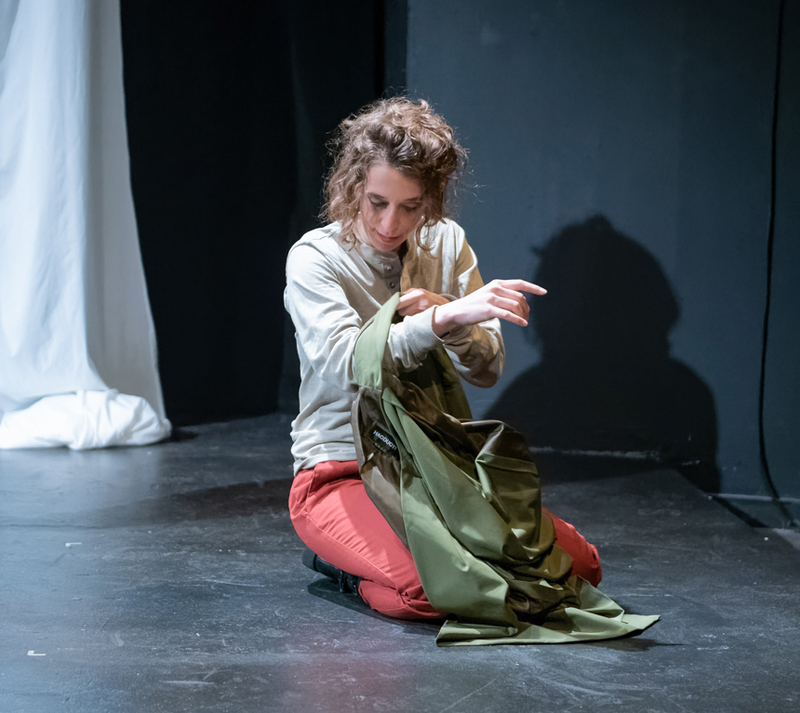 Rahamim, theater stalwart Troy Johnson and young Sarah Haas all hunched over and twisted their necks and shoulders in ways that added to the creepiness also issuing from their faces. Haas, a petite and pretty blonde on elevator boots, has extraordinary stage charisma. She really projects what her witch is up to, and during those scenes is an eye magnet. It’s going to be fun to watch her career develop. She delivers three other roles as well. Maya Greenberg was fun to watch as Hecate, the goddess of witchcraft, who is angry about what the three witches have done, and is on hand to ruin Macbeth’s life. She has even more neck, shoulder and torso twisting to do than the three witches. Greenberg is from Israel and has a strong Hebrew accent that actually kind of helps with her lines as Hecate. It is less helpful when she is Banquo or the doctor. Nobody attempts any pseudo English accents. The words don’t need accents. Also on hand is Jonathan Covey, usually a sound designer, on stage for the first time in 10 years. He is fine in three roles. “Macbeth” is bloody and tragic, but it also includes many of the greatest lines we have come to love from Shakespeare. This is an excellent opportunity to hear them delivered well. Tasi Alabastro as Macbeth, left, and Maria Marquis as Lady Macbeth at the Dragon Theatre during a rehearsal for "Macbeth," which runs March 15 - April 7, 2019.